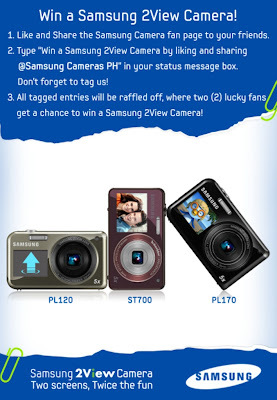 Home / 2view camera / camera / contest / digital camera / facebook / samsung / samsung philippines / Win a Samsung 2View Camera! 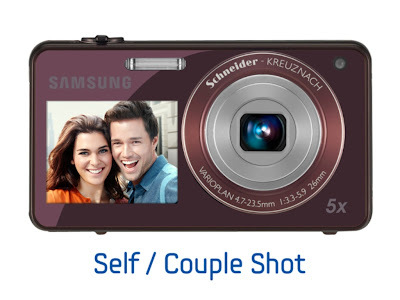 Win a Samsung 2View Camera! I remember the last time I was with my B1 Friends, Hermee brought his brand new and really amazing Samsung 2View Camera. That time, I came to our reunion with a DSLR camera. I know, comparing the specs and the outcome of the pictures, a DSLR still prevails but when it comes to being so handy and cool features, I must say that that Samsung 2View Camera has something to say. Hermee let me check out the cool specs of his new toy, and here's what I got. This Samsung’s newest point-and-shoot innovation has dual LCD screen that can be found at the front side and back side of the camera. And because of this, you can easily preview self-portraits giving you a 100-percent fun experience because you will always be a part of your picture! 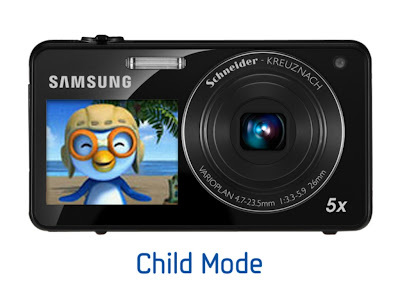 This camera has also a Child Mode feature that can create an animation show that will help you make your child smile while taking the pictures. And another favorite feature that I learned was it has a Jump Shot feature. 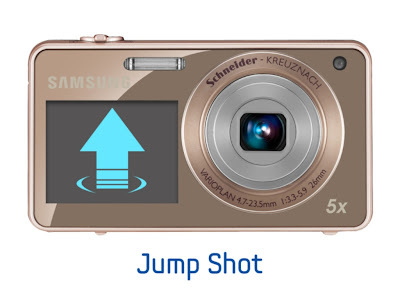 i know a lot of us love jump shots, and so, with this feature, the front LCD flashes a countdown to give you the right moment to capture that wonderful jump shot of you and of your friends and family. 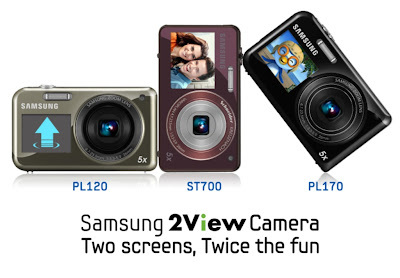 The Samsung 2View Camera series is composed of ST700, PL170 and PL120. And with all of these amazing features, let me share to you this great news! We can now all have a great chance of owning one because Samsung Philippines will be giving away not just one but two (2) 2View Cameras until May 30, 2011. And it is so easy to join, all you have to do is LIKE the Samsung Camera PH Facebook Page - http://www.facebook.com/samsungcamerasPH. Then, just type as your STATUS MESSAGE “Win Samsung 2View Cameras by liking and sharing @Samsung Cameras PH”. Don’t forget to tag the Samsung Camera fan page! All tagged entries will be raffled off and two (2) lucky followers will win a Samsung 2View Camera ST700! That's so easy, right? I'm a big Samsung gadget lover, and having one of these cameras would definitely make me happy and would be a great gift to me for my coming birthday, so I really hope I win on this contest! Hahaha! If you wanna join the contest too, feel free to see and like Samsung Camera PH Facebook Page!